From lemon, grate 2 teaspoons peel and squeeze 2 tablespoons juice. In 3-quart saucepan, heat clam juice, water, tomatoes, chorizo, and saffron to boiling over high heat. Stir in peas; heat to boiling. Remove saucepan from heat; stir in couscous, 1 teaspoon lemon peel, and 1/4 teaspoon salt. Cover and let stand 5 minutes. Meanwhile, pull off and discard tough crescent-shaped muscle, if any, from each scallop. Rinse scallops under cold running water to remove sand from crevices. Pat scallops dry with paper towels. In medium bowl, toss scallops with 1/4 teaspoon salt, 1/4 teaspoon pepper, and remaining 1 teaspoon lemon peel. In 12-inch skillet, heat oil over medium-high heat until very hot. Add scallops; cook 5 to 6 minutes or until browned and opaque throughout, turning over once. Remove skillet from heat; stir in lemon juice. 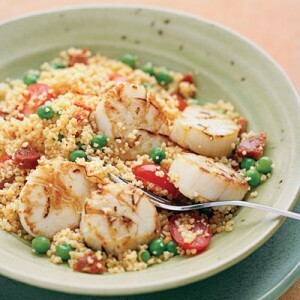 Fluff couscous mixture with fork and serve with scallops.